Tucked away in a studio in East Village, a group of guys who started as a production group grew into something more. While living together in Alphabet City, they wrote a song that was more rock than what they normally write. That song was called “Swim”, and that band became Late Night Episode. Guitarist Eric Sherman and vocalist Daniel Lonner had been writing songs together since high school, while bassist Giovanni Stockton-Rossini and drummer Brett Daniel attended the same college. They were all living together when “Swim” was written, and it was their manager at the time who persuaded them to continue making more songs like that one. “We didn’t know if we were going to do it or if we were going to give it to someone else, but [their former manager] said we should really continue making songs like this,” Lonner said. “It’s mainly about high school nostalgia: going out late at night, meeting up with girls, sneaking out, that whole vibe,” Lonner said. After their first single release, the reaction to “Swim” was bigger than anything they had written or produced before. It became the reason why they continued creating music for themselves rather than others. Since then, the band has spent the majority of their time creating new music in the studio, from their home state of New York to Los Angeles, California. Their second single, “Lost in Cali”, was released as a demo after one of their LA studio sessions. Despite it not having that full band sound, it was a blend of everything they wanted their music to sound like. “It was the vision that we were going for, between the acoustic and the rock but still this songwriting heavy rock music that’s pretty pop in essence,” Lonner said. 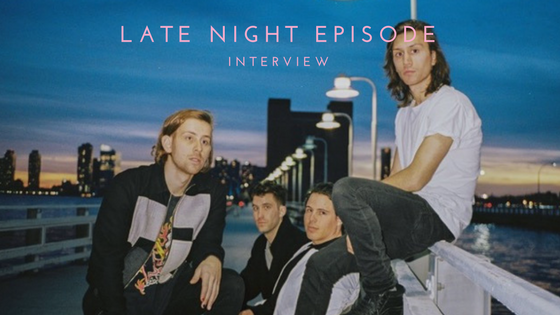 Late Night Episode currently has four songs to their name, but this is just the beginning of their journey. With the West Coast vibes and the East Coast sound, their dedication to studio time and hundreds of songs in the works, there is much more to come in the new year.